What level of commitment is expected of the team that agrees to draft a child through Team IMPACT? Although there are no strict requirements regarding the specific amount of time invested/level of interaction, our expectation is that “there is no off-season” and the child will benefit from consistent socialization by participating in a full range of team activities both on and off the field throughout the calendar year. My team is signed up. How long will it take before we are matched with a child? The length of time a team is on the waiting list varies. When selecting a team for the child, our highest priority is finding a team that is close to the child’s home or where they are being treated so the family can conveniently get to campus. In addition, this allows student athletes to do activities off-campus with the child. We cannot guarantee a child for each interested team within a specific time frame, but we maintain an active dialogue with major medical facilities and other like-minded organizations in an effort to identify more deserving children to be drafted onto each interested team. How long is a typical Team IMPACT relationship? 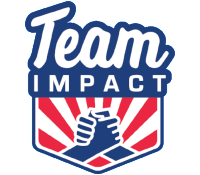 Team IMPACT is a two-year program, which can vary based on specific circumstances. 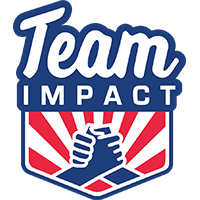 I am involved with a high school or semi-pro sports - are we able to be part of Team IMPACT? Currently, our mission is focused on working strictly with college athletic programs because of the year round commitment to one team and the mentorship that a group older than the child can provide.